This Oatmeal and Honey Recipe has become a special favorite of mine. I’m not sure why except that I like the natural smell; the slight oats smell that it seems to carry with it. I wanted to wait until Spring to make any more soap, because my last batch cooled down too fast and I had to reprocess it. It’s hard to get the temperatures right when it’s freezing outside and pretty cold inside too. It turned out great, but I enjoy cold-process soap more because I like the smooth texture and hardness of the bar. 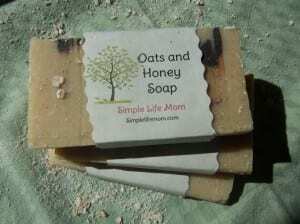 Well, I couldn’t wait to make a batch of Oatmeal and Honey Soap. I really wanted to go ahead and get it done so that it would be ready for gifts at Christmas. 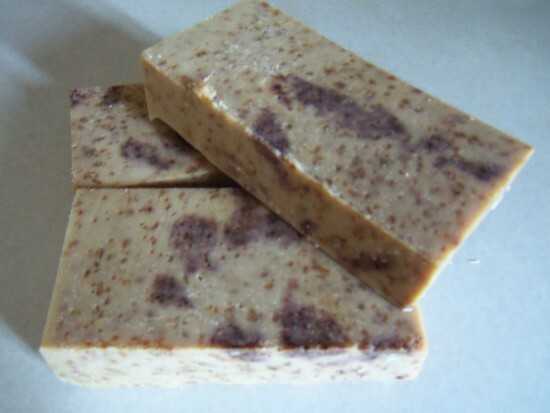 For more specific directions on soap making go HERE to my Soap Making page. This Oats and Honey Soap is really pretty because of the drip effect of the cinnamon, The honey adds extra bubbles when being lathered, while the ground oats gently exfoliate. I did not add any essential oils because I like the natural oats smell that this soap has, but feel free to add whichever essential oils that you feel best goes with this recipe. Combine beeswax, lard, olive oil, cocoa butter, and coconut oil in a large stainless steel pot and melt. Cool to 100 degrees F.
Outside, combine lye to water (never water to lye). Combine Fats and Lye water when both are 100 degrees F.
Mix with a hand or stick blender until trace. Add blended oats (blend before starting soap process), cinnamon, and honey. Mix with a hand or stick mixer until ingredients are fully incorporated. Insulate for 24 hours, then remove, cut, and let cure for 4-6 weeks. Thank you for sharing your creativity. Initially I thought we might use this in our homeschool during our handicraft time (with my daughter especially). But I also love the idea that we could make them in time to give as Christmas gifts! You mentioned your preference for cold processed soap. Might that be easier for us to try first as beginners? I also homeschool! This is a cold processed soap recipe. There are a lot of things to do during and at the end. You can definitely go for it, but as beginners you may want to try the basic recipe, just adding your lovely smells at the end. As long as you treat the lye with respect and lots of ventilation it’s fine to do with older kids. I would not recommend doing it with young children because even after you mix the lye/water mixture into the fats the mixture will burn if it splashes onto you. If you want to make it for Christmas, make it soon, because it needs 4-6 weeks to cure. You can also make it and then reprocess it in a crockpot with a very low setting and it will be ready to use right away. I’ve done that and it turned out great. Well my crafty girl is almost thirteen, so that’s np. 🙂 Thanks for the crockpot idea. I think that’s what we’ll try first. Yay! Looking forward to trying this. Great. Let it set up fully before adding it to your crockpot. Melt it down slowly. When it starts to heat up, stir until it’s thoroughly cooked. It never liquifies. You can find lots of places on the internet that talk about it. I hope it turns out great. I have really enjoyed your blog! So far, I have made your castille soap w/o the peppermint, as I only wanted a base. I then made a castille version of your honey oatmeal soap, I have collected all the ingredients to make the lard version, just have not made the time. I’ve also made your chocolate several times and have varied by adding melted peanut butter prior to freezing. Thank you so much for posting your wisdoms. All of your recipes that I have used have worked with out fail. Will this recipe work without the oatmeal? I’m worried about washing it down the drain and clogging my pipes. It will work great without the oatmeal. It is ground almost to powder so that it gives the soap a little texture, so there is no possible way it could clog pipes. My wife says that she saw some at a box store, it seemed to be affordable for soap making… However I just wanted to check with you if this processed lard would work? I am not sure what is in it to give it a shelf life, I think DHT…. I have no idea what that is…. So you mentioned to think of your soaps in three ways, I thought that was great advice. So if we think of the fats here, could any oils be used instead of lard? A related question, can I add some different oils ie; avocado, castor, cocoa butter, shea butter to a basic castile soap recipe as long as the olive oil amount is correct? If the recipe required 26 ounces of olive oil, could I add 1 ounce of shea butter, 1 ounce of castor oil and 24 ounces of olive oil? This formulation would still give me the required 26 ounces of fat needed for the recipe. You can use commercial lard. It will make great soap, but yes, you need to figure out what’s in it. Some local grocery stores will save the fat that they trim and give it to you, or sell it for pennies. Hello. I really like your site and quite a few of your soap recipes. I’m going to start making my own soaps and like this oatmeal recipe with the exception of the lard (I want to make all vegan soaps). Could I not replace the 64 oz of lard with 64oz of a solid vegetable oil at room temp, like Shea Butter or Avocado? I was reading the the question above mine with replacing the lard and I thought I read that bottom line when you make soaps you should have 60% hard oils, 40% soft oils…if you stick to that hard to soft oil ratio you can replace oils and the soap will always turn out and cure as a hard bar of soap with the suds/lather being the main difference….Is this not true? The short answer – no. It is more complex than just 60-40, though that can often work with various recipes that you know are successful when you tweak them slightly. For example, I just changed a recipe that I love to add more shea and less of something else, and the soap turned out hard as a rock. It’s a fine soap, it just doesn’t lather like I want it to. The reason is that different fats give different qualities to the soap. Within the soap making process, the oils are completely busted open and transformed into soap molecules by the lye. There are properties that remain in the soap, which is why we choose various oils. Could this recipe be made in a crock pot ? Yes, you can hot process this recipe. This is the correct recipe. I don’t know what doing wrong. I’ve tried this recipe twice. It falls apart when I cut it. My second batch was better, it didn’t come to trace as soon as I added the lye! I used a different scale. I didn’t add the cinnamon. And I used different oils, but only an ounce like your recipe calls for. When I plugged the oils in the soap calculator, the water and lye were high, but I’m too new to understand the percentage of water to oil ratio. Sandy, the plugin I use for the recipes went crazy a few months ago and everything was switched around. I thought I caught all of them, but this one wasn’t caught. I’m sorry. There is definitely too much lye!! It’s fixed now.